The USS Minneapolis (CA-36) on 9 November 1943. The USS Minneapolis CA-36 cruisers is a famous unit of the United States Navy. She received 16 battle stars for World War II service, placing her among the most decorated US ships of World War II. 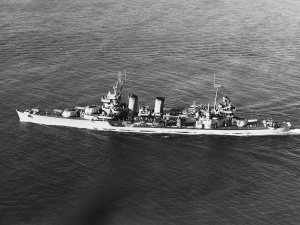 The New Orleans-class cruisers were the last U.S. cruisers built to the specifications and standards of the Washington Naval Treaty of 1922. 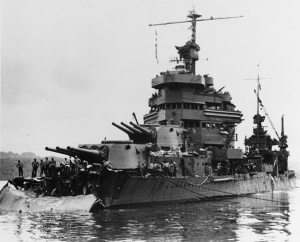 Such ships, with a limit of 10,000 tons standard displacement and 8-inch calibre main guns may be referred to as “treaty cruisers.” Originally classified a light cruiser, because of her thin armor, she was reclassified, soon after being laid down, a heavy cruiser, because of her 8-inch guns. The term “heavy cruiser” was not defined until the London Naval Treaty in 1930. She participated in many battles during the Pacific War including Coral Sea, Midway and Tassafaronga. In the latter battle, she was severely damaged by two Japanese torpedo hits.